This is Speakers Corner, or Yarra Bank as it was called in those days. It was a major venue for public speaking from the late 1880s, and on 4th October 1916 it was the venue of the country’s largest anti-conscription rally. It’s the 4th October 1916, and WW1 has been taking its bloody toll for 2 years on Australia’s youth. Australia is in turmoil and here, at this now quiet and peaceful place, was a crowd of some 100,000 people. This is Speakers Corner, or Yarra Bank as it was called in those days. It was a major venue for public speaking from the late 1880s, and on this day it was the venue of the country’s largest anti-conscription rally. Prime Minister Billy Hughes had recently returned to Australia after being away for 8 months visiting London and the battlefields in France. The war was going badly and more men were needed to fill the ranks of the dead and wounded. Conscription seemed to be the only answer and soon became a major issue with a referendum set for 28th October 1916. A YES vote was championed by influential groups such as the Australian Women’s National League. In addition, major newspapers ran headlines warning Australians that the Kaiser wanted you to vote NO but the ANZACS wanted you to vote YES. In response and against the odds, the anti-conscription movement launched a campaign with public meetings in local streets and rallies at venues such as Storey Hall in Swanston Street. The anti-conscription movement was supported by the Victorian Trades Hall, most Labor unions, the Catholic Archbishop of Melbourne Daniel Mannix, a host of anti-war and peace organisations, and notably a young John Curtin, later to become the Prime Minister of Australia during WW2. John Curtin was at the time a member of the Victorian Socialist Party, and was arrested for his efforts. 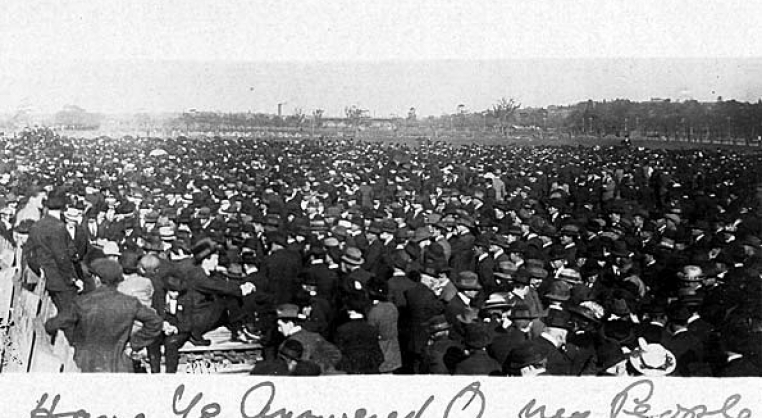 The gathering on the 4th of October was the largest of the anti-conscription rallies, and was organised by the Women’s Peace Army. They marched through the city streets, bringing Melbourne to a standstill, and gathered here to hear a host of women speak against conscription. These included the determined and outspoken women’s suffrage activists Vida Goldstein and Adela Pankhurst. That I doomed a man to death. God’s word – and the brand of Cain. The conscription campaign of 1916 bitterly divided the nation and, much to the ire of Prime Minster Billy Hughes, resulted in a narrow NO vote. Another referendum was held in 1917, again with a NO result. The rising tide of anti-war and anti-conscription sentiments led to the Australian Government bringing in many draconian measures. Singing anti-war songs was banned under the War Protections Act of 1915, and distributing anti-war leaflets was deemed illegal with penalties of between two and four months gaol. The idea of conscription was abandoned for the rest of the First World War. Ironically, however, once an anti-conscription activist, Prime Minister John Curtin, introduced a limited form of conscription during the second world war.